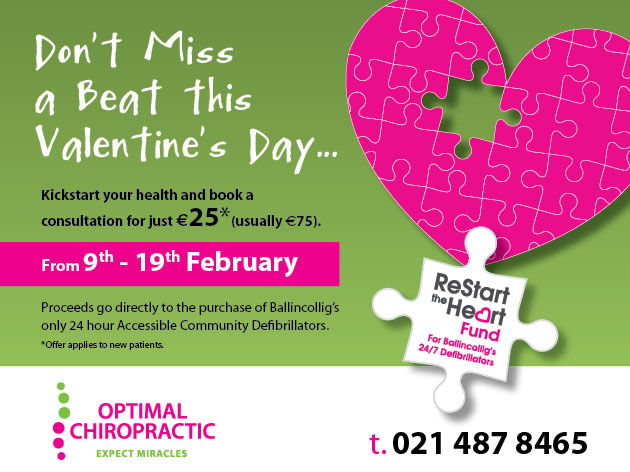 This week we at Optimal Chiropractic launched a special fundraising initiative which will see 3 life saving defibrillators made available to the local Ballincollig community on a 24/7 basis in the next 6 months. This is the first campaign to be run by local Ballincollig businesses to raise enough money to put 3 life saving defibrillators around the town which has a population of more than 20,000 people. The idea for the Restart the Heart fund was born from the realisation that there is no defibrillator readily available in Ballincollig on a 24 hour basis. The provision of these community defibrillators will see lives being saved. This fundraising initiative will also give people who have not experienced chiropractic care the opportunity to witness the benefits of regular spinal adjustments to their overall health and well-being. Regular chiropractic adjustments lead to better spinal health which has been proven to increase overall well-being and body functions. I look forward to showing this to new patients throughout the campaign from February 9th -19th while also raising funds for the vital Restart the Heart fund. Those interested in booking a consultation for €25 from February 9-19 can call Mary on 021 487 8465 for an appointment. I look forward to seeing you.